Does SGNS (Word2Vec) encodes word frequency ? I’ve been wondering for a while about the behaviour of SGNS vs SVD/PMI with regards to the difference of performance on analogy questions. (Have a look at Omer Levy’s TACL article for a deep comparison of different methods). One of my hypothesis is that, somehow, SGNS encodes the frequency of the words in its embedding. I think (haven’t tested it yet) that using frequency could help for many analogy questions, since one would expect, on average, that the frequency ratio between A and B is the same than between C and D.
That could actually be quite understandable. Since the update procedure of SGNS is online, the time of the update does have an importance (vectors at time t in the learning are not the same than at time t+s). So two rarely occuring words, if they occur roughly at the same time in the corpus, will tend to be updated by a few similar vectors (positively and negatively, by the way), and thus be highly influenced by the same direction of the data. In other words, the rarer the word, the more its direction “lags behind” the rest of the embeddings, and in some way, the embedding slightly encodes the “age” of the words, and thus their frequency. At eXenSa, we are currently working on a super fast way to preprocess large amounts of documents. It’s based on a combination of our new generation Count-Min Sketch (not the one I’ve posted about before, but an even better version) and a new trick we’ve devised just this week-end. 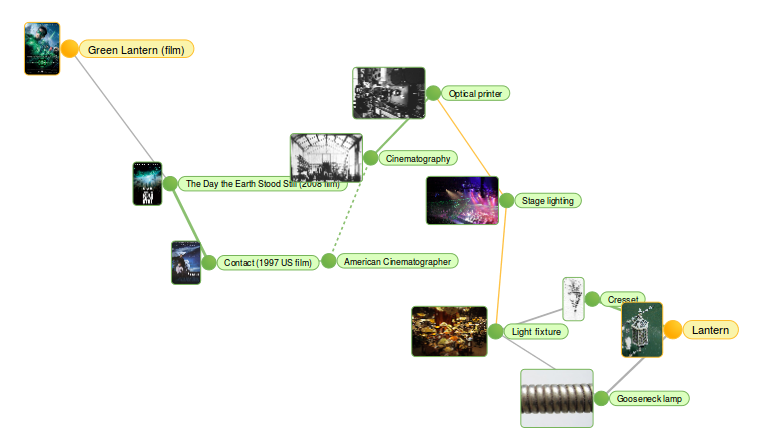 Since my first attempt to compute “similarity paths” between Wikipedia pages on wikinsights.org, we’ve made some progress. 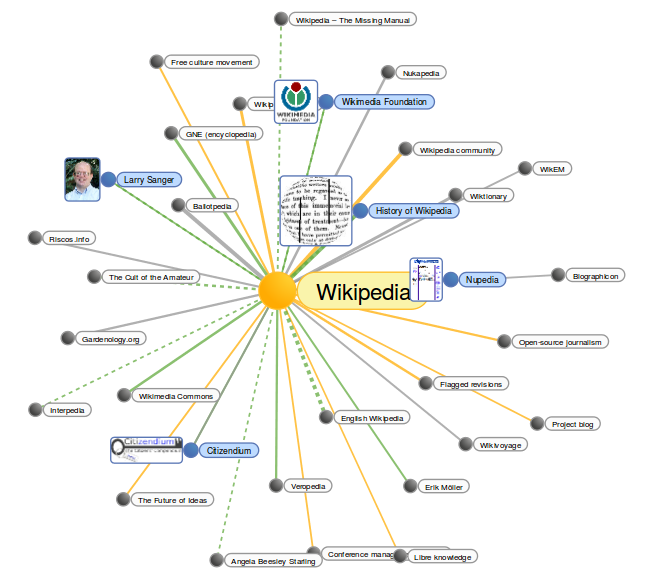 Usually, people use the Wikipedia graph to find path between pages. Unfortunately, Wikipedia is so well linked, that most path are just made of two or three hops. You can, for instance, play with wikidistrict.com to find the shortest path between two articles : from Earth to Heaven with wikidistrict is a short path : Earth -> Deity -> Heaven. Of course there are other paths (a huge number of paths actually). The interesting thing here is the moment where we switch from atronomie to astrology. It happens with “Counter-Earth“, an hypothesis about another planet orbiting the sun in counter-phase with the earth. What I show here is not in wikinsights yet, you’ll have to wait a bit before it comes live, but don’t worry it won’t be too long. We have a few novelties to add to our Wikinsights demo, with a set of improved models. This excellent article by Omer Levy, Yoav Goldberg and Ido Dagan give an amazingly detailed view on what is really behind Word2Vec method and GloVe success. I found it while reading comments on a Radim Rehurek’s post about Word2Vec. Word2vec is one of the method which compete with our proprietary approach at eXenSa (the NCISC algorithm we use in eXenGine), even if it’s limited to words and documents. It produces very good embeddings. What is truly impressive in the Levy et al. article is that they have dissected the algorithm to separate preprocessing choices (such as the word window or the count to weight transformation, which is basically Pointwise Mutual Information), algorithm parameters (for SVD, they show that removing the eigenvalues is always a good choice), and post-processing choices (for instance the distance computation for analogy tasks). The only parameters they didn’t test is the number of target features. This is a bit odd, since that’s one of the selling point of NCISC, which performs very well even with 1/10 of the features required for Word2Vec, but can be easily explained since they already had to test something like 1000 different combinations. As far as I can say, the most important piece of information from this article is that the choice of the method (raw PPMI, SVD, Word2Vec or Gradient Descent) does not play the biggest role in the final performance. It’s not really a surprise, since the main advantage of NN is in there non-linearity, and for text data, you basically already have too much dimensions to require dimensionality expansion. For those who followed the previous steps, I was mentionning in my previous post that there was a very odd behaviour with Count-Min-Log with MAX sampling when the number of layers in the sketch was high. Relative Error curves shows a down bump starting to be visible on the 18th quantile, with a sketch height of 9 and then move to quantiles for lower frequency. For now I only suspect this phenomenon appears with MAX sampling, but I need to rerun the tests without MAX sampling to be sure. From there, two solutions : either the MAX sampling is completely bogus, or the idea of sampling with another value is good, but it needs to be modified to correctly estimate the overrepresentation due to the position of an element in the distribution. On a side note, it’s clear to me that it shouldn’t be too difficult to adapt MAX sampling to classical linear counting. So I’m probably going to give it a try in the next couple of weeks. And I’m still looking for help to compute the bounds of the precision and the probability. I don’t have a clue where to start. Also, I could use some help to find the right way to compute the overestimation factor from the distribution of the sketch values for a given element. I’ve had a particularly exciting and busy week, but I did manage to find some time to pursue the empirical evaluation of the idea of using log approximate counting to improve performance of the Count-Min Sketch on the Relative Error, particulary on the low frequency items. Last week after writing my previous post I wrote an email to Ted Dunning, asking him for some advice and feedback about my idea. He very kindly replied, and advised me to perform some verification on the behaviour of my algorithm along the axis of the width and height of the sketch. He also politely suggested that my graph were really crappy, thanks to my inappropriate use of MS Excel to produce them. I apologize to everyone I may have hurt by doing such an awful thing, but I was in a hury and so excited that I had to do with what was available to me at the time. This week I learned enough R and ggplot to present you some fantastically interesting data in an eye-pleasing. A few words about the setting : this time I’ve used a super tiny Zipf(1.1) synthetic corpus : vocabulary = 1024 , words = 1048576 . I’ve tested extensively with sketch widths ranging from 2 to 65536, and heights from 1 to 32. The first obvious observation is that Count-Min-Log is only interesting under high pressure (i.e.) the total size of the sketch is much smaller that the ideal perfect counts storage size that one would need to count the frequency of the 1024 terms occuring in the corpus (supposing you have a mapping between terms and an index). The maximum gain is apparently obtained when the size of the sketch is 32 times smaller than the vocabulary size, and the height is clearly a very important factor in Count-Min-Log. As a consequence, if it is right to project these results to bigger settings (I don’t know if it’s right), you would get a Mean Relative Error about 350 times smaller using a Count-Min-Log Sketch of 125MB to count 1 billion elements (for instance trigrams), than using a Count-Min of the same size. To obtain the same result with a Count-Min, you would have to use a 4GB sketch. Focusing on the first quantile (the vocabulary with the least occurrences) show a very interesting picture of the behaviour of the Count-Min-Log. The effect of the MAX sampling that underestimates the increases in the count to compensate for the collisions seems to be maximum with a given width/height ratio, which seems to be very low. MAX sampling plays an important role in the gain seen using Count-Min-Log. Without it, the gain would be probably about 5 or 10 in the best situations. The idea of MAX sampling comes from the fact that the impact of hash collision is much more important for low frequency items than for high frequency items, by using the value of the cell with the maximum value when flipping the coin to decide whether to increment the Log counter. If an item has a low frequency, then it is very likely that the maximum value is much bigger than the min value, whereas for high frequency item, the min and the max should be very close. With MAX sampling, the increment is skipped more often, wich underestimates the count for items which would be overestimated. So it can be understood that having more layers in the sketch is a good thing because it helps to estimate the position of the item in the distribution. However, it is maybe only true if the collisions are numerous enough. Next post will be a test of more heights and more fine grained widths, let’s say 2,3,4…100 ? I’ve made a few experiments to have a look at the behaviour of the Count-Min-Log Sketch with Max sampling. Here are some interesting comparisons between classical Count-Min (the graphs show both the usual CM algorithm and the Conservative Update version), and Count-Min-Log. For the sake of simplicity, I’ve chosen to limit to one setting in terms of memory use : in every sketch we use the same number of bits (here, 4 vectors of 4000*32 bits). I have also just shown the result of 8 bits Count-Min-Log (i.e. with base 1.095) with or without the progressive base (PRG). Let’s start by the results under heavy pressure. Here we have 8 millions events in an initial vocabulary of 640,000 elements. The values are plotted for each decile of the vocabulary (i.e. on the left is the first 10th of the vocabulary with the lowest number of occurrences). Average Relative Error per decile for high pressure setting. Root mean square error per decile for high pressure setting. Now for the low pressure setting, still with 4 vectors of 4000*32bits for everyone, but this time the initial vocabulary is only 10000 and the number of events is about 100k. Average Relative Error per decile for low pressure setting. Root mean square error per decile for low pressure setting. Conclusion, for equal memory footprint, Count-Min-Log seems to clearly outperform classical Count-Min for high pressure settings, both for RMSE and ARE, with the exception of the RMSE for the top 10% highest frequency events. Under low pressure, it is clear that top 20-30% highest frequency items counts are significantly degraded. I think that for any NLP-related task, Count-Min-Log is always a clear winner. For other applications, where the highest frequency are the most interesting, the gain may be negative, given the results on the high pressure setting. It will depend whether you care about ARE or RMSE. Count-Min sketch is a great algorithm, but it has a tendency to overestimate low frequency items when dealing with highly skewed data, at least it’s the case on zipfian data. Amit Goyal had some nice ideas to work around this, but I’m not that fund of the whole scheme he sets up to reduce the frequency of the rarest cells. I’m currently thinking about a whole new and radical way to deal with text mining, and I’ve been hitting repeatedly a wall while trying to figure out how I could be able to count the occurrences of a very very high number of different elements. The point is, what I’m interested in is abolutely not to count accurately the number of occurrences of high frequency items, but to get the order of magnitude. I’ve come to realize that, using Count-Min (or, for that matter, Count-Min with conservative update), I obtain an almost exact count for high frequency items, but a completely off value when looking at low frequency (or zero-frequency) items. To deal with that, I’ve realized that would should try to weight our available bits. In Count-Min, counting from 0 to 1 is valued as much as counting from 2147483647 to 2147483648, while, frankly, no one cares whether it’s 2147483647 or just 2000000000, right ? So I’ve introduced an interesting variation to the standard Count-Min Sketch, a variation which could, I think, be of high value for many uses, including mine. The idea is very simple, instead of using 32bits counters to count from 0 to 4294967295, we can use 8 bits counters to count from 0 to (approximately) 4294967295. This way, we can put 4 times more counters with the same number of bits, the risk of collisions is four times less, and thus, low frequency items are much less overestimated. If you’re wondering how you can use a 8 bit counter to count from 0 to (approximately) 4294967295, just read this. It’s a log count using random sampling to increment the counter. But it’s not all, first we can use the same very clever improvement to the standard Count-Min sketch which is called conservative update. And additionaly, we can add a sample bias to the log-increment rule, which basically state that, if we’re at the bottom of the distribution, then probably we are going to be overestimated, then we should undersample. Finally, we can have a progressive log base (for instance when the raw counter value is 1, the next value will be 1+1^1.1, but when the raw counter is 2, the next value will be 1+1^1.1+1^1.2). Zipfian distribution is not a power law, so why not go one step further.. The results are quite interesting. Obviously the absolute error is way worst than the absolute error of a standard Count-Min. The Average Relative Error, however, is about 10 times less with different settings. * Created by guillaume on 10/29/14. I still have a Firefox t-shirt labelled “Take back the web”. I think this goal hasn’t been more important than today, with the rise of so many social networks. With the failure of email on the spam-fighting front, the weaknesses of DNS to properly enforce trust in network communication, I think it’s time to build an ecosystem of social communication, not based on a company or even a free software (as did Diaspora), but on a set of protocols that could allow messages, information, search, affinities, trust and money to be distributed and exchanged between identities on the web. The ideas from virtual distributed money can maybe be reused to some extent, but other methods, for instance to deal with distributed affinities or search needs to be invented. For once, public intervention may be a good idea. I’m pretty sure the EU would be wise to invest a lot of money in this envdeavour, to break free from our US friends and their companies. We’ve worked hard to make WikInsights more appealing and fun to use. Now it has a graphical interface with a graph view of the neighbours of Wikipedia. Of course, the graph is dynamically generated and expose the most relevant neighbours along various dimensions, it’s not a view of the Wikipedia page graph. Have fun with it, and enjoy discovering new and relevant pages. Copyright © 2017 Mostly linguistically computational.